A mix of clouds and sun with gusty winds. High around 55F. Winds NNE at 25 to 35 mph. Winds could occasionally gust over 40 mph..
Clear skies. Gusty winds during the evening. Low around 35F. Winds N at 20 to 30 mph. Higher wind gusts possible. 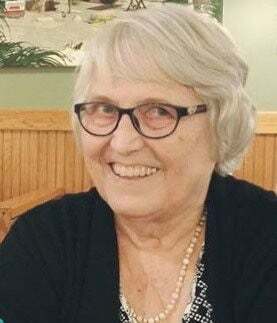 Leta Elvira Hamm, 85, of Normal, passed away at 2:44 p.m. Tuesday (Feb. 26, 2019) at OSF HealthCare St. Joseph Medical Center, Bloomington. Leta was born Dec. 23, 1933, in Huntington, Ind., to Guy and Mary Grace Crist Hamm, both of whom are buried at Park Hill Cemetery, Bloomington. She married Peter Whitmer Krueger on Nov. 5, 1954, in Bloomington. He survives. She is also survived by one son, Daniel Lee Krueger, Normal; many nieces and nephews and numerous great-nieces and great-nephews. She was preceded in death by one son, William “Bil” Krueger, and her siblings, Mary Leona Griffith, Carroll Hamm, Eleanor Gordon, Ray Hamm, Iladora Taylor, Lawrence Hamm and Ruby Hamm Reed. She earned a bachelor's degree from Illinois State University and later earned her master's degree at University of South Florida. Leta loved her career as a librarian and worked at ISU, in Oregon and at Lee County Library System in Florida where she was a manager. She retired in April 2009. Leta loved to travel (domestically and internationally). She lived life to the fullest, was full of love and was an inspiration to family and friends. Her memorial service will be at 2 p.m. March 23 at Calvert & Metzler Memorial Home, Bloomington. Charlie Moore will officiate. Visitation will be one hour prior to the service. Inurnment will be at Evergreen Memorial Cemetery, Bloomington. Memorial contributions may be made to St. Jude Children's Research Hospital.